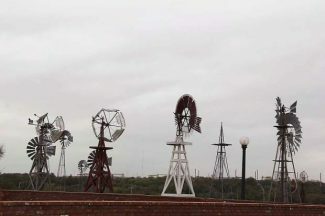 A collection of windmills spin in the wind outside the American Windpower Center and Museum in Lubbock, Texas. 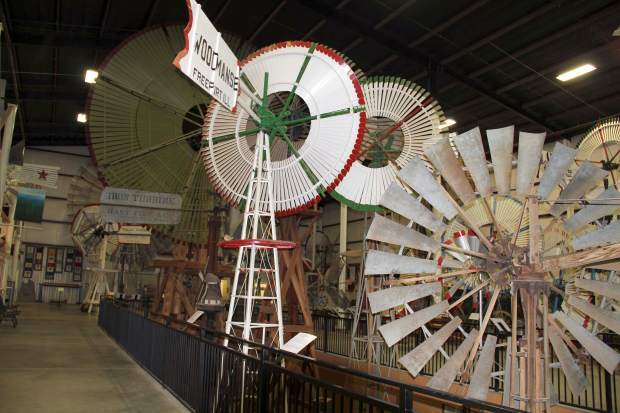 More than 150 types of windmills are on display at the American Windpower Center in Lubbock, Texas. 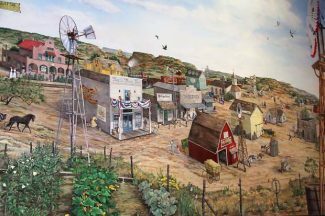 The story of windpower in America is brought to vivid life in a mural by Lubbock, Texas, artist LaGina Fairbetter. "Our next stop is the American Wind Power Center," my guide in Lubbock, Texas, told me as we drove through the city. Oh, great, I thought with more than a bit of skepticism, figuring it would be a center telling me something about kilowatts or volts, or power metering. So I was blown away (pun intended!) when we drove onto the grounds of the center and I saw an array of windmills and even a modern wind turbine. One of the exterior exhibits is the Flowerdew Hundred Postmill. This replica mill was built in 1978 at Flowerdew Hundred, a plantation in Virginia where the first windmill in America was built for Sir George Yeardley in 1621. That original windmill was destroyed in a storm, but archaeologists found remnants of it, leading to the building of the replica centuries later. Now that replica post-mill is a centerpiece of the exterior exhibits at the American Windmill center. (Centerpiece, that is, if you prefer replicas of something old rather than a modern General Electric Wind Turbine.). That was only the appetizer. When we went inside I found a stunning array of original windmills dating back to the mid-19th century. To get a sense of the history of wind power in America imagine a "canvas" that is 172-feet long and 34-feet tall, then imagine the story of the windmill from the 1700s to the present, and you have a mural that covers two entire walls inside the Wind Power Center, in a space that is used for special programs and events. This mural by artist LaGina Fairbetter has so much detail, so many animals, plants and settings that it might take you days to really see it all in the detail. By studying it even for a few minutes you can let your eye rove from past to present. Then walk among the more than 150 windmills that are on display at the center. 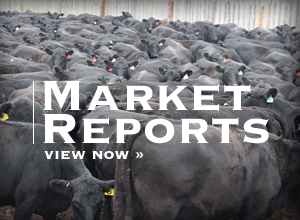 Some may be familiar structures; you still see them dotting the prairie and plains landscapes where they do their job of pumping water for livestock. 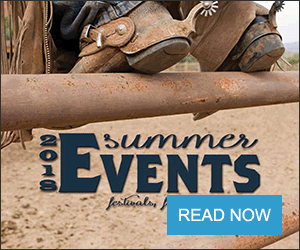 Of course, earlier uses of windmills involved providing a supply for homesteaders and even townspeople who relied on underground water sources. The invention of the self-governing windmill had a significant influence on the development of the western two-thirds of the United States. Between 1854 and 1920, over 700 companies manufactured tens of thousands of windmills. 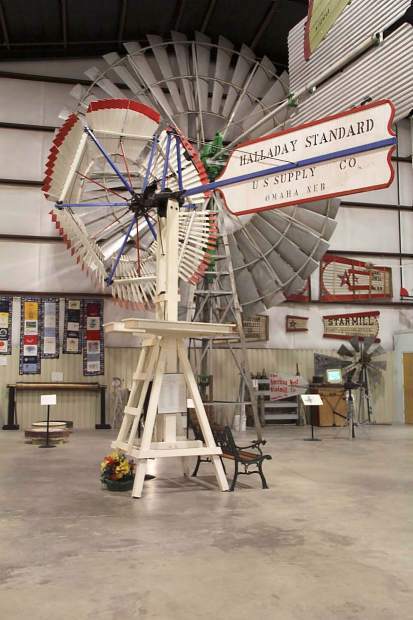 The story of those companies and the windmills they produced is the mission of this center. Its beginning dates to the mid-1960s when Billie Wolfe, a Texas Tech faculty member, taught courses in "Housing Design for Family Living." Among the supporting documents used in the classes were photographs of farm and ranch structures. And many times a windmill was depicted in the photograph. Recognizing that the windmills shown in the old photographs were becoming decrepit, in some cases disappearing from the landscape altogether, the professor began taking more photographs and interviewing farmers and ranchers who had windmills. One thing led to another and before long she was collecting these windmills from sites in Texas, and then farther afield. She met Don Hundley owner of the Windmill Hill Museum near Mitchell, Neb., who had, according to the Windmill Center's website, "the premier collection of early American windmills in the country, many beautiful hand pumps, difficult to find windmill weights and rare salesman's model mills." When Wolfe assured Hundley his collection would remain intact, he sold it to her rather than to the Smithsonian, which had also expressed interest in the extensive collection. Ultimately Wolfe and Coy Harris, a Lubbock native and CEO of Wind Engineering Corporation, established the National Windmill Project as a non-profit organization. They brought the entire Hundley Collection, which consisted of 48 windmills, 171 weights, 56 pumps, numerous photographs and models, to Lubbock. It took years to fully develop the existing Center and Museum, but today you can see the Hundley Collection, and many more windmills Outside are dozens of windmills providing a stirring welcome to the site as they spin in the wind and provide picturesque silhouettes.